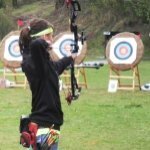 On this page you will learn about nocking the arrow, which is the second basic archery step of the shot sequence. In this step you will learn how to properly nock the arrow on to the bowstring and signs that you should be aware of that indicate that your equipment may need a tune-up. Nocking an arrow can appear less than elementary to many archers but you would be amazed at the number of beginners and experienced archers who struggle with this seemingly basic process. For high performance and competitive archers this one basic step can mean the difference between a win or a loss and they put a great deal of emphasis on this step every time they nock an arrow by making it a part of their normal routine. By doing so, they become acutely aware of any difference in the equipment that may cause even the slightest deviation in arrow flight. What does nocking the arrow mean? Nocking the arrow is the process of holding the arrow so you can snap the nock onto the bowstring. It also means checking that the arrow's index vanes or fletching are orientated on the bowstring for proper clearance as the arrow passes the riser. It also means paying close attention to where the nock is attached to the bowstring in relation to the nock set or D-Loop. Hold the arrow shaft close to the nock behind the fletching or vanes. Place the arrow shaft on the arrow rest. Rotate the shaft so the index vane is pointing in the right direction. If you are uncertain about how to properly index your arrow on the arrow rest go to the arrow rest page for compound shooters. When the index vane is properly aligned or orientated, SNAP the nock of the arrow onto the bowstring under the nock locator or nock-set (Recurve Bow) or between the nock locators if you use two nock sets. The process is the same for compound archers unless you are using a "D-Loop". When nocking an arrow on a bowstring with a D-Loop, the knock on the shaft goes between the upper and lower knot of the D-Loop. If there is a gap left after the arrow is snapped into position, the nock on the arrow shaft should be pushed toward the top of the D-Loop. That is all there is to nocking the arrow...or is it? The truth is, every archer will develop their own method of nocking the arrow and there is no particular way to do this easily in the beginning. 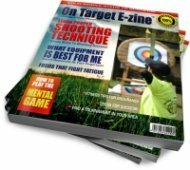 You will develop your own technique while you practice your stance and other basic archery steps. The only advice I can offer for this step is to be patient while learning to manipulate the arrow and always remember that safety is paramount. Keep the arrows pointed down range at all times while nocking the arrow on the bowstring. The real key to this step is to be aware of how the nock feels and how it sounds when it is "snapped on to the bowstring". The nock on the arrow shaft should SNAP on to the bowstring with the same amount of force from one arrow to the next. If you have some arrows that slide right on to the bowstring with little or no effort AND you have other arrows that require excessive force to get them snapped on to the bowstring then you are going to have minor variations in arrow flight. Make sure your nocks are all the same size...yes - there are different size nocks for different size strings. Not all bowstrings are the same. Some are thicker and some are thinner because of the type of material and the number of strands that are used to make the bowstring. In the middle of the bowstring where your arrow attaches (near the nock-set or D-loop) there is some additional material wrapped around the main bowstring. This is called the center serving. The center serving material will become compressed or worn out and may begin to fray. This can cause your arrow nocks to fit loosely as time goes on. It is then time to replace the center serving. The fit between the nock and the bowstring should not be too tight. If you are struggling to get the arrow snapped on to the bowstring then change the size of the nocks to a larger size hole OR change the center serving material to a smaller strand size. Conversely, the arrows should not be so loose that they fall off of the bowstring when you draw the arrow back. Nocking the arrow can be cumbersome at first until you have learned to manipulate the arrow. This single step is sometimes the most frustrating step for new archers. Be patient with yourself and keep the arrow pointed down range at all times so that a misfire does not result in a stray arrow, property damage or injury. There are several equipment maintenance and setup details that you should be aware of as it relates to the nocks and bowstring. These conditions will determine your overall level of success. Ignoring these archery equipment basics will lead to inconsistent shots and frustration. Have A Question About Nocking The Arrow?